Shemara Refit’s ambition to bring sustainable fast ferry construction back to the UK (see Ship & Boat International July/August 2016, pages 60-62) has been realised, with the group having secured a contract to produce two new 35m-long boats for London-based operator MBNA Thames Clippers, in what is being hailed as the UK’s biggest domestic ferry order in more than 25 years. The Shemara Refit team, which was responsible for the construction of Red Funnel’s 41m, 279-pax Red Jet 6 (ibid. pages 60-62), officially rebranded itself the Wight Shipyard Co. Ltd (WSC) in September. The company changed its moniker shortly after purchasing boatbuilder Southampton Marine Services (SMS), which will now handle steel vessel construction and motor yacht restoration, while WSC concentrates on fast ferry and aluminium vessel production. 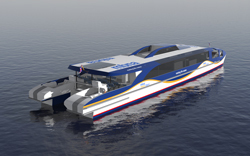 As with Red Jet 6, the designs for the new ferry duo have been supplied by Australia’s One2three Naval Architects. The forthcoming ferries for MBNA Thames Clippers will measure 35.37m loa (or 32.63m lwl), 8.07m in breadth (excluding the fender) and 2.75m in depth, and draw 1.05m. Each vessel will be powered by two Scania DI16 072M engines, generating 625bkW at 2,300rpm and feeding a pair of Rolls-Royce Kamewa 40A3 waterjets through twin ZF 2000 gearboxes. Each ferry will be able to accommodate up to 178 passengers and three crew members, with room for 10 bicycles. Other onboard capacities include tankage for 3,000litres of fuel, 600litres of fresh water and 600litres of waste water. Together, the newcomers will boost MBNA Thames Clippers’ river network capacity by an extra 14%. Overall, the contract has been valued at more than £6.3 million (US$7.7 million) and is expected to generate 75 new jobs across the Isle of Wight and London. The duo will enter service in summer 2017, having been classified by Lloyd’s Register to ✠A1 Passenger G1✠LMC notations, and sailing under Maritime & Coastguard Agency (MCA) HSC 178-pax Category C status, approved for Area Category 5. MBNA Thames Clippers recently scooped the title of Ferry Operator of the Year at the UK National Transport Awards, in recognition of its investment in and operation of river bus services for commuters and tourists within the British capital. The group estimates that its fleet will have carried more than 4 million people around London this year alone. “This new order signifies that use of the river as a means of commuter transport is growing quickly,” Morton adds.